WASHINGTON — With an assist on Tuesday night, Alex Ovechkin passed Sergei Fedorov as the top-scoring Russian player in NHL history. The Washington Capitals captain picked up his 1,180th point on T.J. Oshie's goal that opened the scoring in a 3-2 victory against the Vancouver Canucks. Ovechkin broke the record in his 1,055th game, 193 games fewer than Fedorov played. "It's history, and I passed all those legends," Ovechkin said. "It's pretty big and I appreciate everybody who do all work with me, my teammates, and it's huge. When you start playing hockey and you came to the NHL, you just have a dream to score one goal or two and now I'm No. 1 on the all-time Russian list." Ovechkin and Fedorov played together with the Capitals in 2008 and 2009 and remain friends. Ovechkin said he spoke with Fedorov and is sure the Hockey Hall of Famer is happy he passed him for this record. 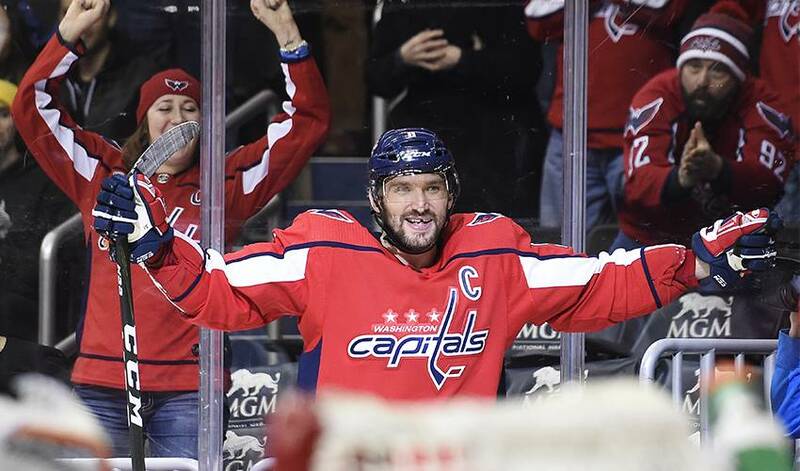 "I knew eventually it's going to come, but it's pretty big," Ovechkin said. "It's pretty huge. To be No. 1 on the all-time list, it's nice." The 33-year-old from Moscow leads the NHL with 37 goals and paces the Capitals with 58 points. He's coming off winning the Conn Smythe Trophy as playoff MVP as he led Washington to its first Stanley Cup in franchise history. Ovechkin long ago passed Fedorov for the most goals among Russian-born players. He has 644 goals and 536 assists in his NHL career. "We're so fortunate to have him here in Washington," coach Todd Reirden said. "You take for granted what a special, special player he is, not even just here in Washington, but for the whole National Hockey League and how he's really been that second tier, maybe third tier of Russian players that have come over and now they just continue to turn out players."